Written by roxeteer on April 17, 2009 to Live and Per Gessle. HELSINKI - Per started his Party Crasher tour last night in Helsinki, Finland. And oh, what a night it was! Per absolutely rocked the place and the audience liked what they heard. The song choices were a bit surprising, especially since there were only two songs from the "Party Crasher" album. There were no less than five songs from the "Son Of A Plumber" album and the rather unknown song, "I Have A Party In My Head," seemed to get the biggest applause from the audience. Per didn't play any of his Swedish songs, but that was quite predictable since the tour extends outside the Nordic countries. Written by roxeteer on April 16, 2009 to Live and Per Gessle. 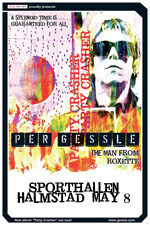 HELSINKI - Per Gessle starts his first-ever European solo tour in Helsinki tonight. Per is performing at Tavastia Klubi where he also performed during his "Mazarin" tour in 2003. Per's gig will start at 10pm EET. Gessle will be supported by Martinique, aka Martin Josefsson. Martin is also the husband of Helena Josefsson who sings in Per's band. Martinique will start playing at 9pm EET. Written by roxeteer on April 12, 2009 to Live, Marie Fredriksson and Per Gessle. Per has started his tweeting career enthusiastically. He has already answered dozens of fans' questions using his @PartyPleaser Twitter account and revealed some nice tidbits about the forthcoming tour. The most interesting piece of information so far has been that Per has discussed with Marie about performing with him on the tour. "[S]he might pop up somewhere, we've talked about it," Per wrote in his tweet. Another revealed fact is that the Stockholm concerts on May 9 and 10 will be filmed, and "most likely" there will be a live DVD available after the tour. Written by roxeteer on April 1, 2009 to Live and Per Gessle. hola every-1! to celebrate my 30 years in pop music me and the heavy metal kids are going to play the greatest pop songs ever for you guys and gals! it's gonna be so cool to play 'eye of the tiger' and other favorites on stage!!! and hey, don't forget to send your suggestions for songs! we still haven't decided which three songs will be the mr gee songs we play!!!! The missing songs will be selected from the ones fans have requested. Written by Jud on March 18, 2009 to Live and Marie Fredriksson. 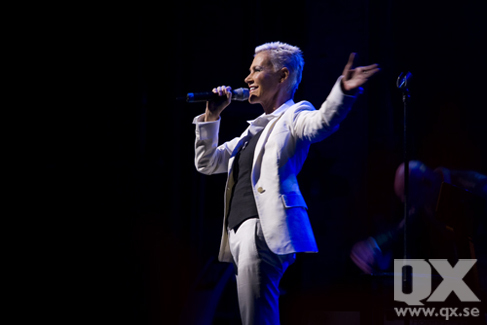 As announced earlier this month, Marie Fredriksson performed last Thursday in Café Opera, Stockholm, in an event called "Still rocking in the free world". Together with Lasse Lindbom, Niklas Strömstedt, Mats Ronander, Annelie Rydé, husband Mikael Bolyos and son Oscar Bolyos, she remembered those great times in the '80s on Café Opera's stage. Marie covered Aretha Franklin's "I Never Loved A Man", "El Paso" and sang her own hit "Ännu doftar kärlek". The big surprise of the evening was however Marie's 12 year old son Oscar Bolyos, who performed Lenny Kravitz's "Stand By My Woman" and the Rolling Stones's "Jumpin' Jack Flash". Videos and photos of the event can be found on Expressen, Aftonbladet and Hotgossip. Written by pwbbounce on March 15, 2009 to Live and Per Gessle. these venues were changed because i prefer to play smaller venues (500-800 ppl) on this tour of mine. that has been my intention since day 1. shepherd's bush holds 2300 (way too big for someone like me!) and "large" vega takes about 1300 incl the balconies. "small" vega wasn't available so we set our eyes on pumpehuset. Written by tevensso on March 13, 2009 to Live and Per Gessle. Source: d&d management. STOCKHOLM (Updated) - The upcoming Party Crasher tour has been expanded, with a gig in the Man's hometown Halmstad. May 8 Per will play Sporthallen in Halmstad. "I'm really looking forward to this trip around Europe. I consider it to be some kinda birthday present to myself to be able to play my favorites from The Gessle Box Of Songs In English. "My ambition is to put together a guitar-based power-pop-set specially designed for the club scene! There will be loads of Roxette songs I haven't sung since the demo days but also favorites from the Plum, World According to… and of course Party Crasher. And why not a jolly cover, or two? "I love the fact that we've been able to squeeze in a gig in cookin' Halmstad before the band vaporizes after the two gigs May 9 & 10 in Cirkus in Stockholm (other duties are in the can for my eminent musicians). Friday May 8 we'll be ready to roll the dice in Sporthallen in my hometown, with guitars almost-in-tune and smiles on our faces. Playing in Halmstad always makes my heart beat just a little bit faster." Tickets will be available at Ticnet Wednesday March 18 at 09:00. Written by roxeteer on March 8, 2009 to Live and Per Gessle. The Swedish talkshow host Barbro "Babben" Larsson is back on TV with her show Babben & co. On the comeback show on March 21, Per will be performing live. Babben & co will be broadcast at 8pm CET on SVT1 and simultaneously on SVT World. Reruns will be broadcast on March 22 (SVT1 and SVT24), March 23 (SVT1) and March 27 (SVT1). Check SVT World site for their program schedule. Written by roxeteer on February 27, 2009 to Live and Marie Fredriksson. Marie Fredriksson Online reports that Marie will perform live on stage in Café Opera, Stockholm in an event called "Still rocking in the free world." The event is organized by Lasse Lindbom who is remembered as the producer of Marie's early solo albums. According to the event information in Facebook, the event, taking place on March 12, is dedicated especially to the people "who used Café Opera as their living room in the 80s." The tickets (450 SEK) are only available via Swedish bank giro, so it may be difficult to obtain tickets abroad. Other artists in the event will be Mats Ronander, Anne-Lie Rydé, Niklas Strömstedt and Lasse Lindbom. They are performing together with the musicians Pelle Alsing, Mats "Gaffa" Karlsson, Patrik Lundström, Hasse Olsson and Mikael Bolyos. Lasse Lindbom told Marie Fredriksson Online that Marie will perform 4-5 songs, one of them being "Jealous guy" by John Lennon. Written by Jud on February 7, 2009 to Live and Marie Fredriksson. Last Sunday the yearly QX Gaygala, an event organised by the gay magazine QX, took place in Cirkus, Stockholm. During the gala, different celebrities are awarded with prizes such as "Homo of the year", "Hetero of the year", "Artist of the year" to name a few, combined with music entertainment. This year Marie Fredriksson joined the gala and performed a beautiful version of "Tro", together with her husband Mikael Bolyos, who played the piano. According to Aftonbladet, Marie received standing ovations and had a big smile on her face throughout the performance. This time around the Gaygala was not broadcast on TV, but some fans have managed to find short snippets of the performance on Hotgossip.se and on Aftonbladet.